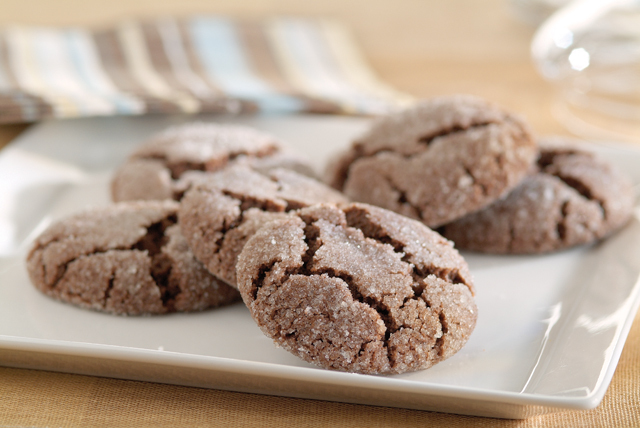 Balls of chocolate dough are rolled in sugar and baked into fudgy cookies with great homemade flavour. Mix flour, baking soda and salt; set aside. Microwave chocolate and butter in large microwaveable bowl on HIGH 2 min. or until butter is melted; stir until chocolate is completely melted. Add 1 cup sugar, egg and vanilla; mix well. Stir in flour mixture until well blended. Refrigerate 15 min. or until dough is easy to handle. Bake 8 to 10 min. or until set. Cool on baking sheets 1 min. Remove to wire racks; cool completely. Omit 1/2 cup of the sugar. Prepare dough and shape into balls as directed. Roll in 1/2 cup finely chopped pecans instead of the sugar. Place, 2 inches apart, on baking sheets. Make indentation in each ball; fill centre with your favourite Kraft Pure Jam. Bake as directed. Cool completely. Omit 1/2 cup of the sugar. Prepare dough and shape into balls as directed. Roll in 1/2 cup finely chopped pecans instead of the sugar. Place, 2 inches apart, on baking sheets. Make indentation in each ball. Bake as directed. Microwave 1 pkg. (269 g) Kraft Caramels and 2 Tbsp. milk in microwaveable bowl on HIGH 3 min. or until caramels are completely melted, stirring after 2 min. Spoon evenly into centres of cookies. Drizzle with melted Baker's Semi-Sweet Chocolate. Cool completely.